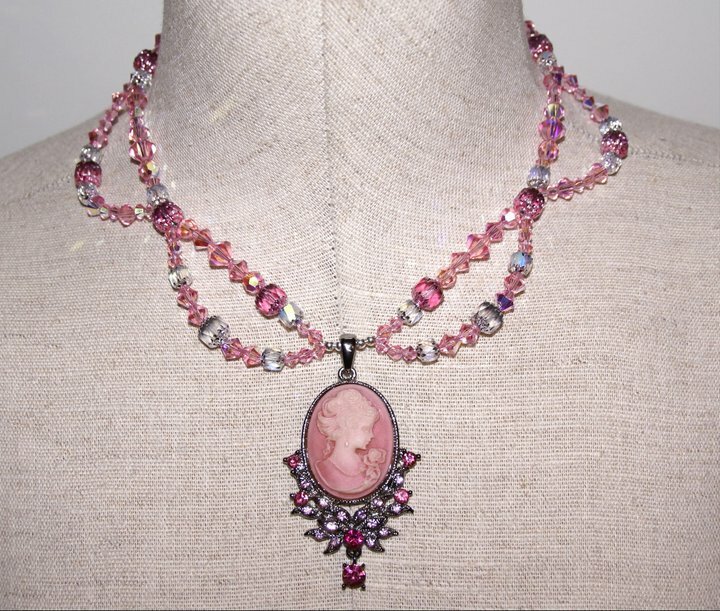 It was a late submission for today, but this necklace took K forever! 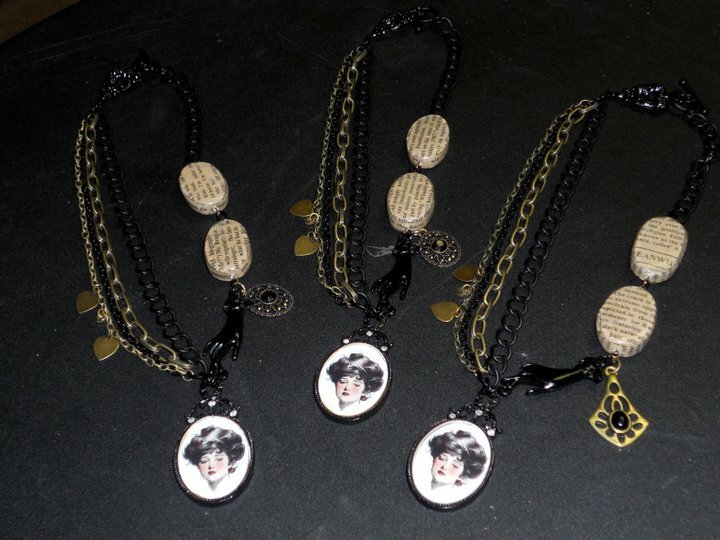 I had to make all the individual links, then make sure that the asymmetrical chains were of equal lengths so that the necklace would hang properly. 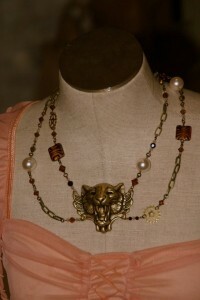 Isn’t that big brass tiger awesome?!? M worked on her quilling technique and is totally dissatisfied with the results. I will need to work more creatively to make things look better, but I did learn some new tricks for using circles to create new shapes and negative spaces. 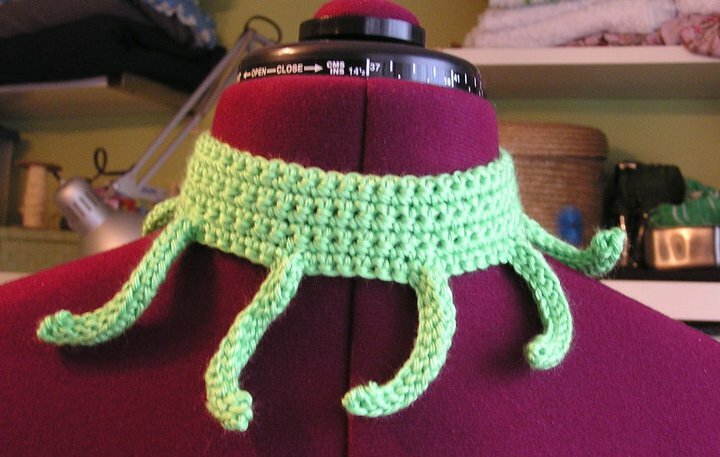 M got the idea to crochet a tentacle necklace when she made the ribbon neck ruffle a week ago. It didn’t turn out quite as I expected, but it is a good base for future iterations. The tentacles definitely need to be longer and fatter and I think they could probably use some mini suckers to make them look more tentacle-like. We’ve made so much stuff in the last couple days and we prepped for Oklahoma Steampunk Expo, we’re not even sure which days each project is really aligned with. But we made a lot of stuff! 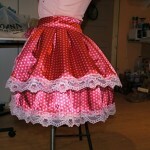 And you still haven’t seen a third of the awesome bustle skirts M cranked out in the last week! 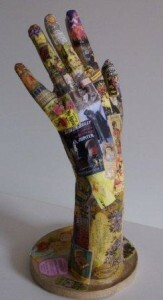 K decoupaged an old partial mannequin to better display our pettipants. She used the directions that came with the glass syringes we sell as they are in Czech and Russian and we couldn’t use them for anything else. 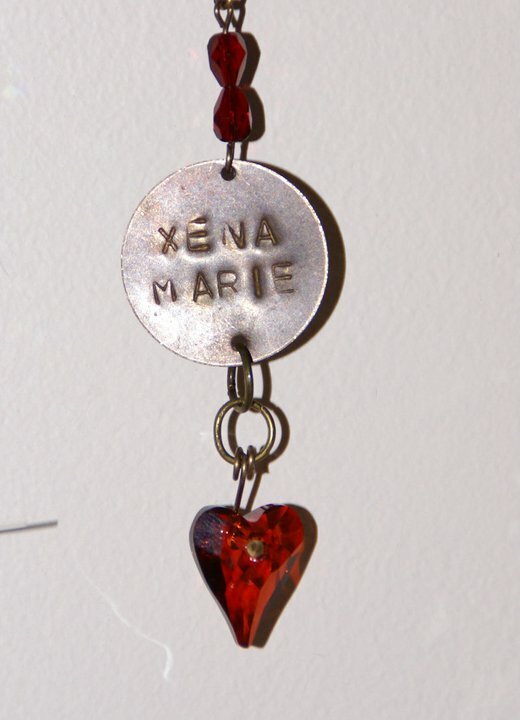 She also made a sun catcher in honor of her kitty Xena who we sent off to kitty heaven this week. 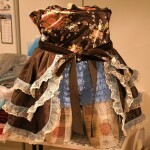 Everything seemed like it was taking forever, especially the dye projects M was working on, but the petticoats turned out awesome with the tea stain. Nothing really, except getting up early and getting set up for Oklahoma Steampunk Expo, which was a feat of strength and mind over matter as we drove 16 hours in the car yesterday, through tornadoes, and got very little sleep last night. None of these are acceptable excuses for our lack of creation, but our booth looks pretty flippin’ sweet so we are counting it as today’s circus as it IS our traveling side show! Today we met the original Ronald McDonald – he has the coolest circus tattoos and grew up as a carnie working on Ferris Wheels! 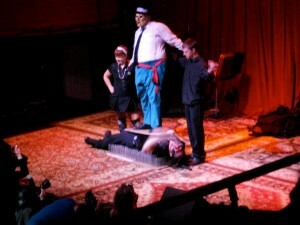 We got our photos with him as our circus… We also met the cutest, most amazing girl ever – Vaudevie from Hellblinki! 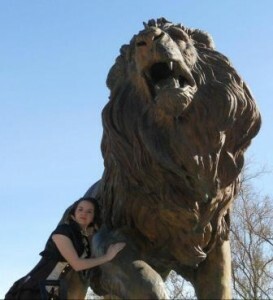 She plays the accordian and recently spent time with the Ringling Brothers band! She is going to give M info on how to learn to play her accordian. Some days we really LOVE our jobs! K started Saturday with the idea of prepping some brass for etching, but didn’t have the proper chemicals for etching, so all I did was the stamping. Some turned out better than others… On Sunday, I decided to finish those dratted Fortune Cookie charms, so I could work on the Fortune Teller necklace I’ve been planning for what seems like months. While I was at it, I made a new one from a fortune I found on Saturday while cleaning and I soldered some of the letter charms I’ve had lying around for years. 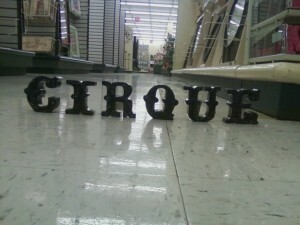 I started with circusy letters, and I have loads more to make, but after about 3 hours of soldering, I decided I needed a break! 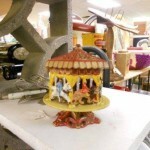 M worked on the hair fascinator base she had rescued after the original had been damaged during our recent convention. I removed the veiling and flower, added the black and white striped trim, covered the top with red sequins and added two gold leaves. Still trying to decide what to use as the focal. I am considering making a flower out of some old zippers. 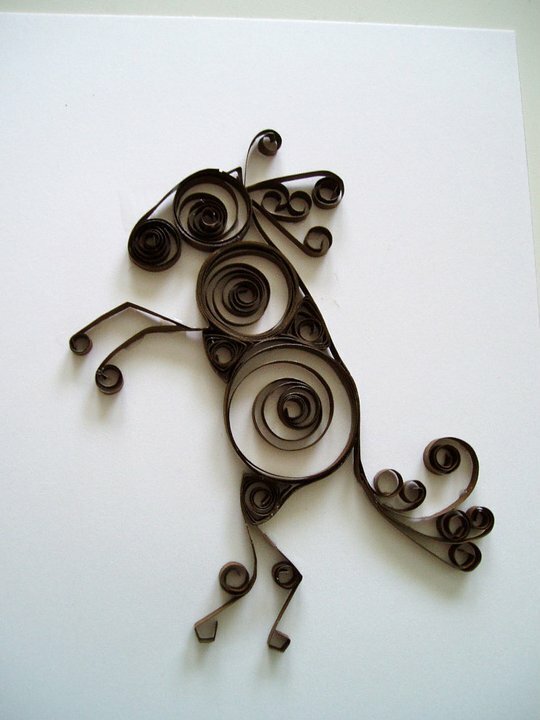 Then on Sunday I woke up with the idea to do some sillhouette art and chose to work on my quilling skills. 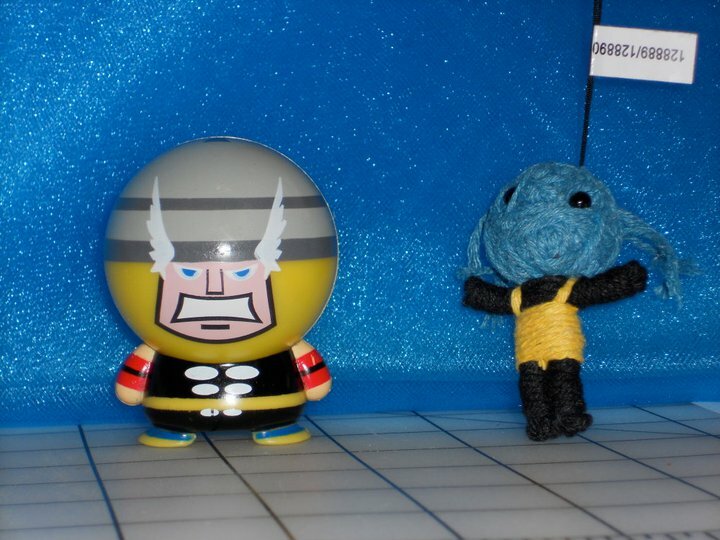 The curly-qs and harlequins were fun to make and they just lent themselves to making a jester/clown. I am really liking how it turned out and may make several more characters along the same theme! So, K started her art project this morning around 11am. 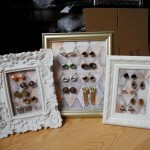 But because I am so disorganizationally organized, I couldn’t find the right materials to finish the project. So, seven hours later, I finally found the beading wire and crimp tubes I was looking for and was able to make the necklace in under an hour. 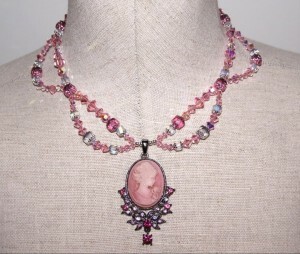 We found the cameo in an antique store in Kansas, and the beads are Swarovski crystal and Jablonex cathedral beads. 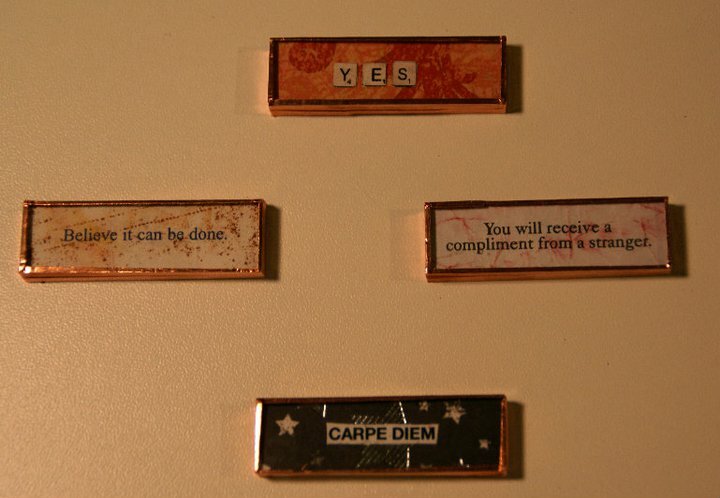 The magnetic clasp has been part of my hoard for about 10 years. 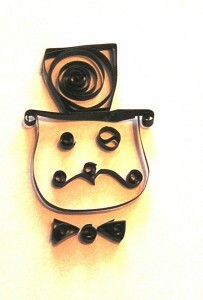 M continued her quilling experiments with a Ringmaster face including top hat, monocle, curly moustache, and bow tie! 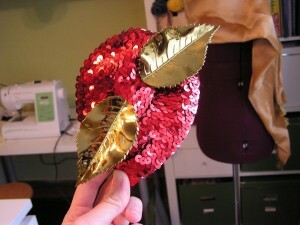 I made the hat but then when gluing it together glued the brim on upside down – GRRR! The moustache is uneven because I used two separate pieces instead of one piece folded in the middle as I started out trying to make a profile silhouette, but it wasn’t turning out well so I switched to a face-on creation. I am not very proud of this one, but I made it… so it counts. 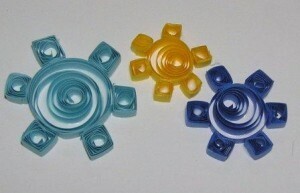 M kept up with the quilling theme she has been adopting this week. I was working in bad lighting so didn’t notice I had grabbed off white paper for his legs until I saw it in the photograph. Oh well, sometimes things like that happen. I particularly like his blue tutu! K’s contribution was several sets of cufflinks, all made from buttons we found on our way back from Tucson. 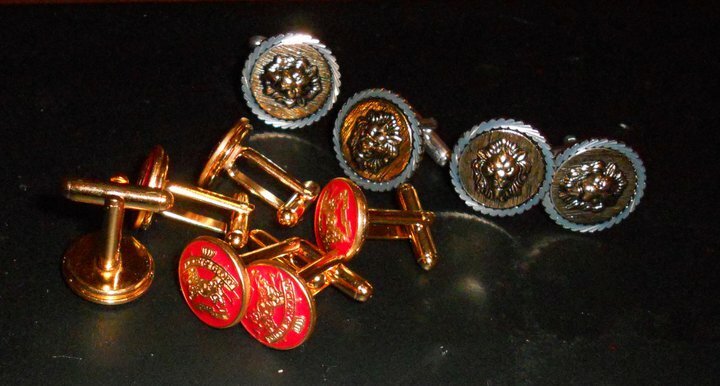 The two sets of lion cufflinks are fit for any Victorian lion tamer, and the red ones read “Victory & Glory”. K started the day by finishing four of her Winged Vial Necklaces, filled with lots of tiny gears and sparkly Swarovski crystals. Then, Kara helped M make lots of bustle skirts (photos TK tomorrow), and K masqueraded as the crazy, moustachioed, and armless freak. 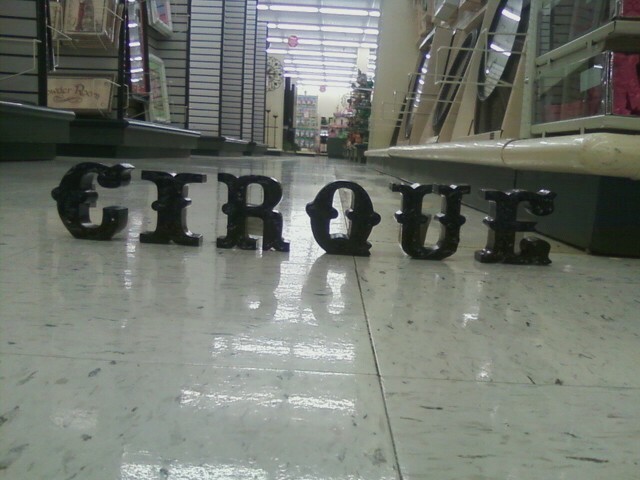 We had to make an emergency run to Hobby Lobby in search of trims/ribbon for M to finish the bustle skirts and decided to use some of their home decor items to create the word “CIRQUE”. M is counting it as her circus because everything else she was working on didn’t get finished. We were VERY productive today! 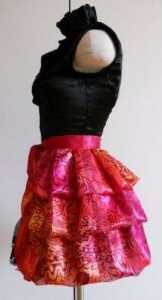 M made this glorious brocade bustle skirt with velvet ribbon waistband and contrasting trim. Don’t you just love it! K started work on a thigh-garter holster for one of the many mini cap guns we discovered at antique stores on a recent outing. The holster is mocked up using paper brads instead of rivets so we can work out the details. 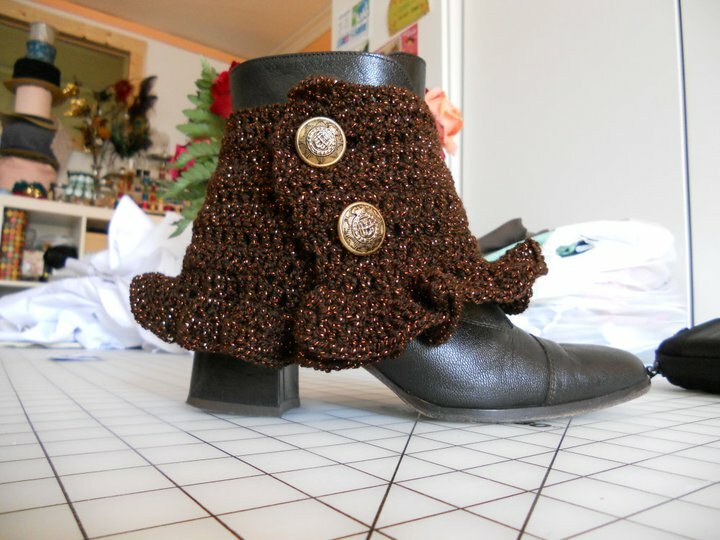 Then, we’ll be embellishing the ruffly garter idea to include leather, buckles, and filigrees! More fun to come! K’s been working on preparing for the Oklahoma Steampunk Expo, and part of that involves preparing jewelry displays. 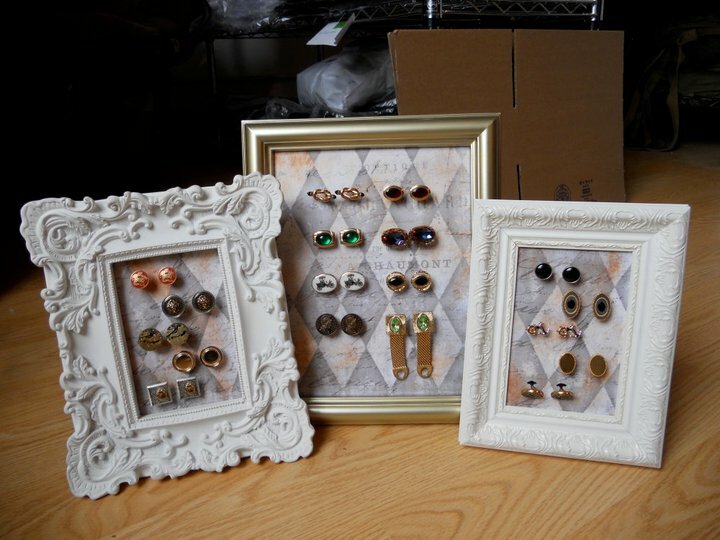 Well, I got tired of looking at the old, ugly, off-center cuff link displays we made last year. So, I decided to remake them, all pretty-like. I think they turned out pretty sweet looking! 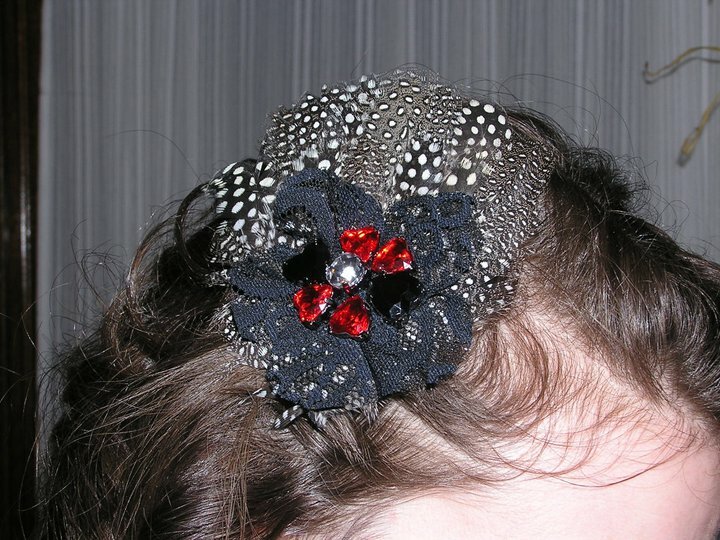 M took an existing hair clip that was just the black and white feathers and added a lace flower she made from some scraps and some heart shaped rhinestone beads. 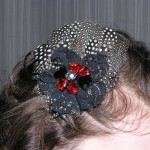 I used the beads to make a little flower, sewed it to the lace flower, then sewed the fl ower onto the feather fascinator. I was tempted to use glue for time’s sake, but I loathe using glue when a more permanent and less messy option is available. We ARE the circus most of the time, and today we show it on the outside. 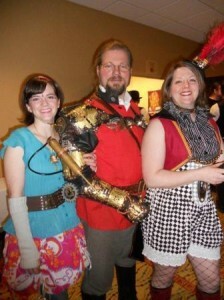 We LOVE our circus costumes, even though most people look at us like we are crazy when we wear them. 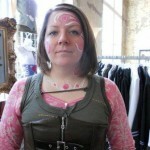 But we are certain this is how Steampunk Circus Folk dress. CERTAIN OF IT! Another day where we get to be the circus, We met the amazing and wonderful Mythica von Griffyn who was just itching to paint us up so on Sunday of AnomalyCon we let her! 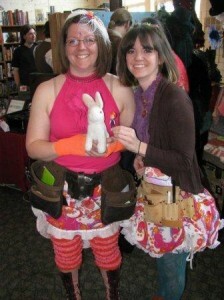 Look at the incredible work she did to match the themes of our outfits! It was kind of cool to sit still for that long and let someone else make us beautiful! Ooh, and the paint had cocoa butter in it so it smelled wonderful and moisturized our skin at the same time! We were all set to the visit the C.W. 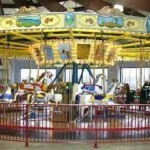 Parker Carousel (a must-see according to the highway billboards) for our circus today, but by the time we got to Abilene, KS and found the carousel (signage was virtually non-existent and the map we got from the Visitor’s Center was all sorts of wrong) it was closed, so we humbly submit this photo of a Carousel Bank that K found at an antique store we stopped at along the way. 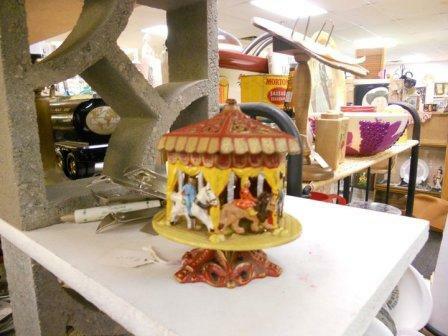 It turns and you put the money in a slot in the top and could see it inside behind the horses. That is kind of cool. 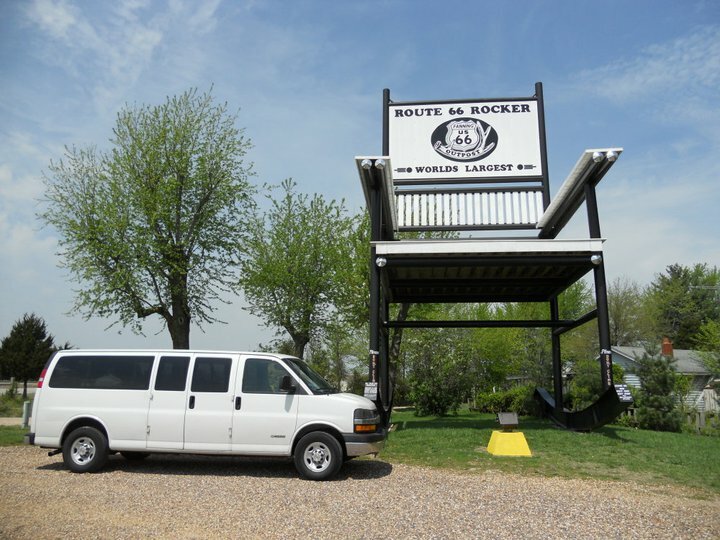 We made a stop in Missouri at an interesting Flea Market/Antique Store to break up the drive home and found a plethora of circus goodness! 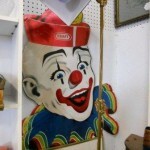 (as well as some super creepy clown stuff!) 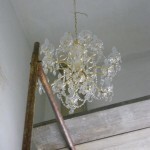 Here is a small taste of the three-ring wonders we stumbled upon! 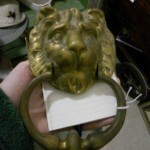 We just LOVE antique stores full of weird cast-offs! Home again, home again, jiggity jig. We unloaded the van, unpacked, re-inventoried the warehouse, and did some fiddly organizing and prep for the next trip, then remembered we needed to make circuses! 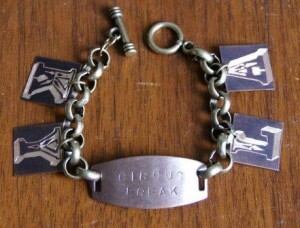 K’s collection of Clockwork Circus Denizens is awesome! 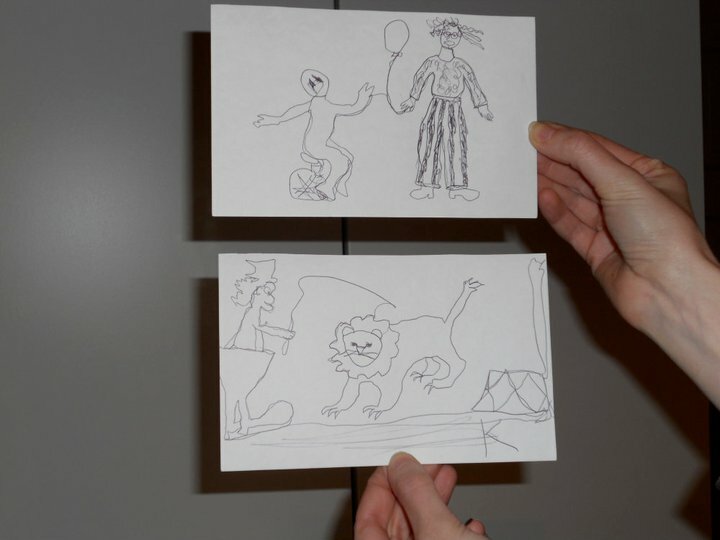 We especially love the monkey and the Evil Kanieval stunt jumper. M worked on a hat band decoration using some bright orange feathers, some sparkle tulle and an old brassy clock key. 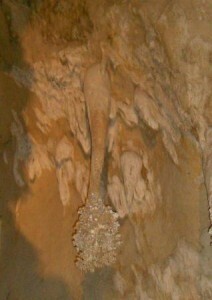 It looks pretty awesome once it is on the hat, but kind of lame all by its little lonesome. We joined forces today and worked on a piece that will end up in production in the VERY near future (we’re talking next week, people!). K was a force for creativity today by opening M’s closet of fabric and pulling stuff out. M tried to ignore her, but just couldn’t let her go on unsupervised. We are very territorial over our respective spaces and supplies. So, we discussed the different fabrics and what they would be best used for and K got to cutting out patterns M had created so we could see if they would work. 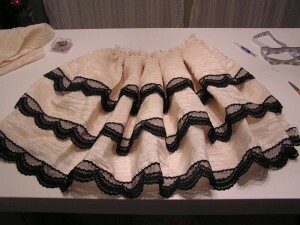 The end result is this lovely tie-around bustle skirt in a sheer and shiny striped silky fabric that is just gorgeous to look at, divine to touch, and has amazing draping and swishy-ness. Yes, swishy-ness IS a word (that M totally made up). K’s circus today is a conglomeration of many partial pieces. 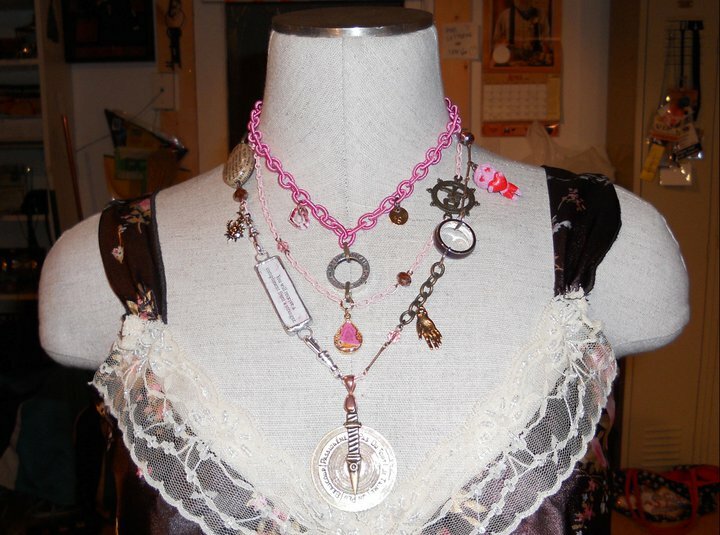 I was cutting out fabric for more of those great bustle skirts M will make next week, and I decided to make jewelry focals. I’m testing some new glues/epoxies, so I may have to fix some of these tomorrow, but I think they’re looking pretty snazzy! I used brass and silver plated filigrees, vintage chandelier glass, rivolis, foil cabochons, and resin roses. M was working on a little hair fascinator, but sliced her hand with the X-Acto knife and so decided to take a break. 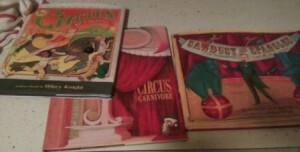 She went out to dinner in Cleveland with a friend and ended up at an awesome store that sold lots of odds and ends from her childhood where she found three truly awesome children’s books about the circus: Circus Carnivore, The Circus is Coming!, and Sawdust and Spangles: The Amazing Life of W.C. Coup. These books are full of interesting art and actual historical facts about some truly amazing circus-obsessed people from the past. In other words, kindred spirits! Our second day vending at AnachroCon: Today we dressed in our circus costumes and met some other people who used old circus folk as inspiration for their costumes too! Then, in the evening we watched a Tesla coil demonstration and M managed to snap a photo just as the spark connected between the two men. If you zoom in on the photo you can actually see the little lightning spark connecting their fingers! 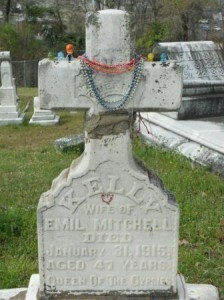 We started the day trying to find the graves of the Gypsy King and Queen, Emil Mitchell and Kelly Mitchell, respectively. We drove all over Meridian, MS because we got terrible directions. Then we stopped and asked for help and found out we were on the wrong side of town! We finally found them and it was lovely to see all the little gifts people left them. We left an orange, some frenzy pennies and some gold dollars. 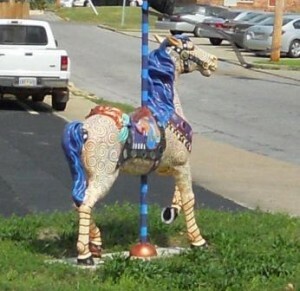 We also saw a bunch of decorated carousel horses in front of the businesses of downtown Meridian. 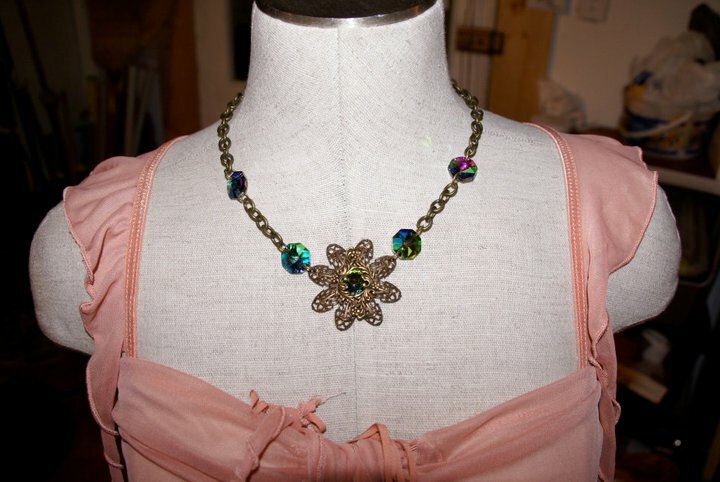 Colorful and whimsical, our favorite! We spent most of the day in the van today, driving across Texas. That is a BIG state!! 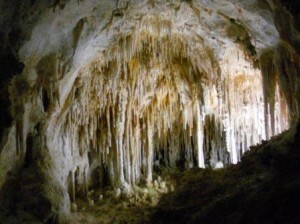 M has a lead foot and so managed to get us to Carlsbad Caverns in time to get in on the last tour time of the day and we saw the Doll Theatre and Lion’s Tail rock formations! 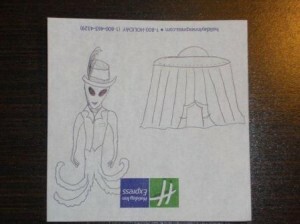 Then we drove to Roswell, NM to spend the night and K decided to make an alien circus! M is counting the photos she took at the caverns. We crashed in Roswell, NM last night (hahaha! Yep, I said it!) and spent part of the day in an awesome antique store in downtown where we found many wonderful things and a few circusy things. 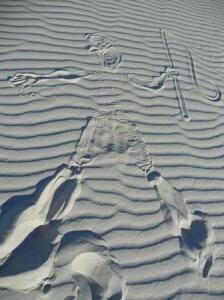 Then, on our way to Tucson, we stopped at White Sands National Park and played on the dunes! 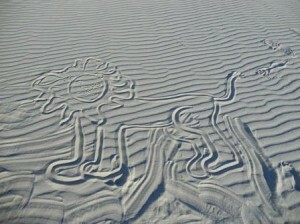 K had the brilliant idea of making sand art and so we made a SandPunk Circus Lion Tamer and Lion. We used M’s body for the Lion Tamer and made her lie down in the sand as if she were making a snow angel, then added the top hat and whip. 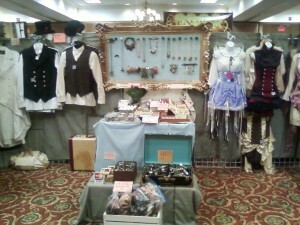 We set up the booth for Wild Wild West Con today and K had to finish up the last of the signage for our merchandise. M finally finished the modding of the formerly white double-breasted vest by adding the fedora buttons she has been hoarding for ages. That’s all we got finished today, folks. We had so much other stuff for the business to get done and we fully intended to get some food and some sleep before the convention started! Today was Day 1 of Wild Wild West Con at Old Tucson Studios, quite possibly the best-looking venue we have ever vended at! We dressed in our circus costumes and got some great shots using the old west village as backdrop. 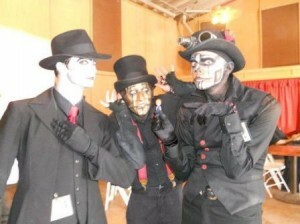 We also got to see Steam Powered Giraffe perform and were super excited by their combination of music and comedy and their awesome theatrical makeup! 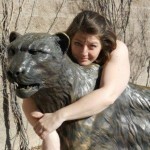 We stopped at the International Wildlife Museum on the road out to Old Tucson Studios to have a photo op with some of the beautiful cat statues! 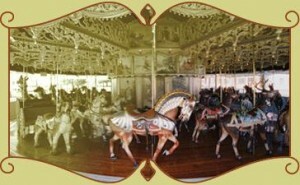 Then we played around the Carousel before the event opened. We were also serenaded by the fun and amazing musical stylings of Steam Powered Giraffe as our booth was right next to the stage! They are superfun and were willing to pose with GingerSnap! We passed this little gazebo every day of the convention and finally stopped to check it out. We were not disappointed. 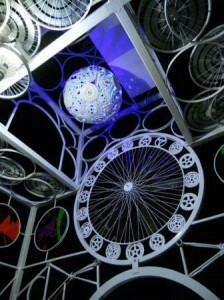 The entire thing is made of bike parts such as chassis, wheel spokes, gears. 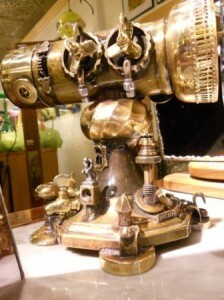 Very awesome and totally Steampunk looking. Oh, and colorful with the stained glass windows. 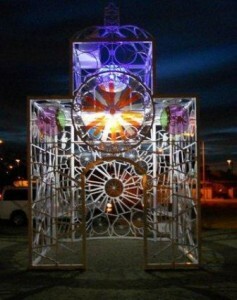 It had a plaque stating it was Bike Church and dedicated to the memory of some people but not why it was built. 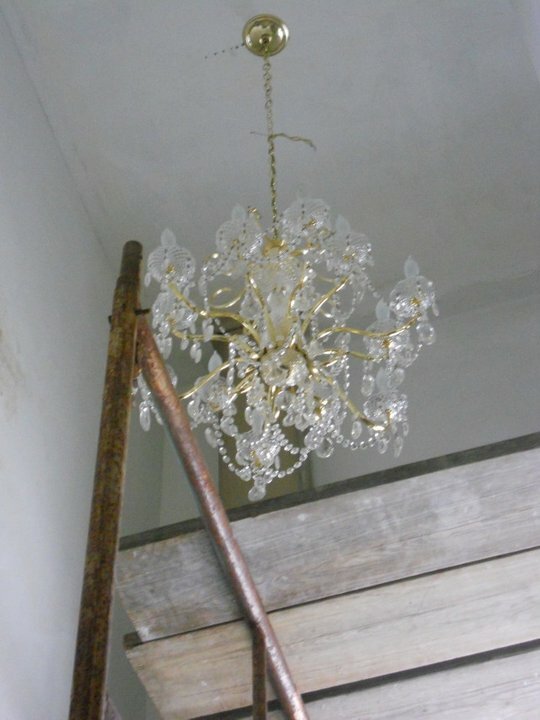 We thought it was very cool and lovely! Today was a driving day. We left Tucson, headed for Flagstaff and made a few stops in the Verde Valley: Jerome and Sedona. We visited quite possibly the coolest store on the planet – Nelly Bly – that is full of amazing and beautiful kaleidoscopes from all over the world in every shape and configuration imaginable! 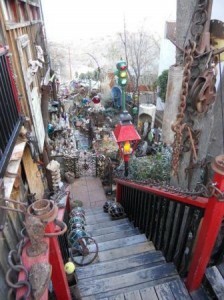 The photos in this album were taken in Jerome. Our camera battery died on us in Sedona so the circusy photos from there are on M’s phone but she forgot to pack the cord necessary to pull them off, so they will be shared later. We also had our auras photographed in Sedona and it was interesting to discover we are the exact opposites and complements to each other! We visited some amazing places today and have chosen to use our photography as our circus. We hope you all bear with us as we are still a few days away from home and will start making more things once we have access to all our tools and supplies. 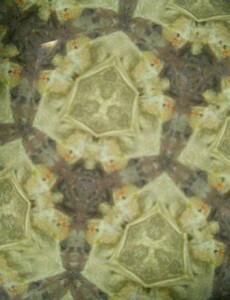 First we have us trying to steal a meteorite (it didn’t work) and second we have a photo K took using our new camera kaleidoscope! There will be lots more photos like that as time goes by and we get better at centering the kaleidoscope to get good shots. 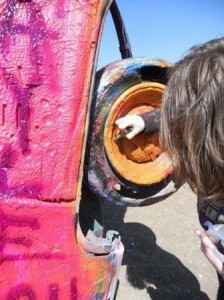 Another driving day, but this time we stopped in Amarillo, TX at the famous Cadillac Ranch. If only we had known it was perfectly acceptable to bring your own spray paint! 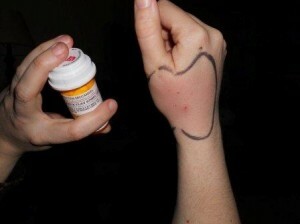 We had to scrounge for a sharpie marker so we could leave our temporary mark. I am sure it has been painted over by now. It was very windy, but well worth the little side trip. So many colors!!! 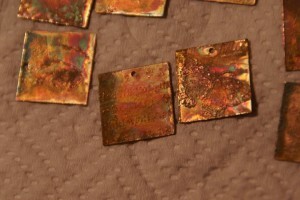 K scavenged some rusted old pieces that had fallen off the cars and were painted all pretty to make some jewelry”Â¦ look for some limited edition Cadillac Ranch pretties from Frenzy Universe in the near future! Look at all the colors!!! 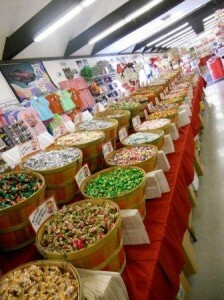 We stumbled across the Candy Factory in Missouri. And by stumble I mean anxiously anticipated the exit after being bombarded with billboards for it for about 20 miles! We weren’t disappointed. 1,000 different snacks!! We didn’t make the candy, but the jig M did when we walked into the shop and saw all the deliciousness was definitely a performance of circus proportions! We bought about 4 pounds of candy and barely scratched the surface of their offerings! Day 70: Umm… nothing. Sorry. That was yesterday. M is totally admitting she did NOT do anything circus unless unloading the van counts (which did involve feats of strength and mild contortionism). There was pretty much no energy left for anything after that. Sorry, folks, roadtrip exhaustion took over and I will try to make up for it in the next few days! K’s creative day did not go to plan. 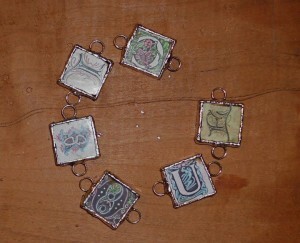 I got started out with a plan to solder those fortune cookie charms, but the jumprings were not cooperating. 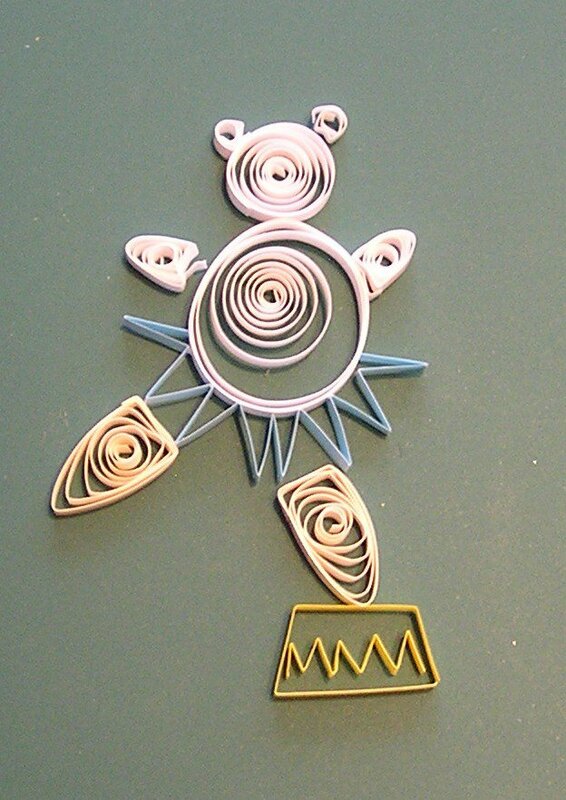 After several aggravated attempts, I realized that I was using aluminum jumprings, so the solder wouldn’t stick. 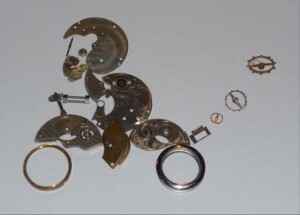 I couldn’t find my steel or silver-plated brass jumprings, so that plan had to be put on hold. 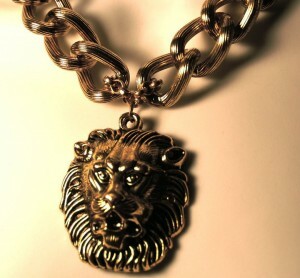 I ended up using some heavy chain I had lying around and this great lion pendant to make the brass lion necklace. M finally got around to finishing the Apron Front for the Striped Bustle Skirt she made several weeks ago. I am not pleased with the way it turned out and think I know where I need to adjust the pattern. I also believe part of why I am not happy with it is the cotton fabric doesn’t drape well and if it were made of a silkier or more fluid fabric I might be more pleased. Here’s to learning through trial and error! M decided to get out her crochet hooks and dig through her yarn stash today. 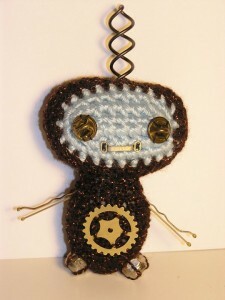 I made this little guy from a pale blue yarn and a brown sparkly yarn. 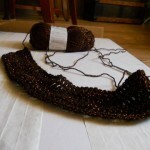 The two yarns were a different weight so it made it kind of awkward when using the same hook. His mouth is a hook and eye slot, his legs are some old lock nuts, his arms are bobby pins, and his antenna is a curly hair pin. He isn’t very circus, but he is darn cute! K got started on two separate drawings, but decided she wasn’t entirely happy with either one. 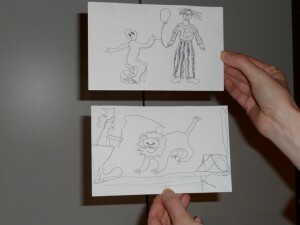 The proportions on the circus performer looked all wrong to me. 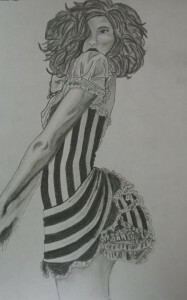 The other drawing is not exactly steampunk or circus, but here’s the story I made up to go with it: She’s a young, Victorian lady with contacts and prospects, but her heart is with the circus, and in this photo, she is stealing away to join the merry band of carnies passing through her town. 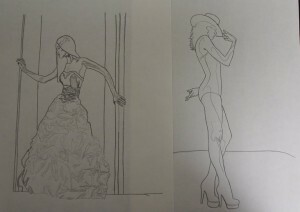 M decided to try her hand at a little drawing while watching back episodes of “Castle” . 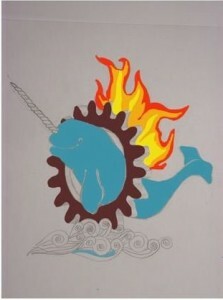 My obsession with narwhals is reaching new heights as I feel the need to create my own! I am not too terribly embarrassed by this one, which is rare. I drew it in pencil and then photographed it and imported it into the Adobe Photoshop App on my iPad. This was my first go at the program and there is definitely a learning curve when using the Pogo stick to color. I gave up before completing it as it got very late and I was doing more erasing than coloring. K went less “circus” and more “carnivale” today with these turquoise and brass earrings. For whatever reason, I was feeling the color combination and the skulls today. Â My inner punk winning out, I guess. 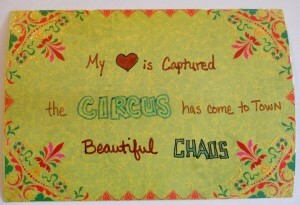 M wrote a Circus Haiku very very late at night and thought it was brilliant! I put it to this pretty paper the next morning to jazz it up a bit as it turned out to not be brilliant after all. Please excuse my sleepy ego and terrible handwriting. K IS the Circus – I was dancing around the fool when M said “we should film that and then you could BE the circus today!” So I put on all the crazy clothes I could find just lying around the workshop and used a rolling stool to “dance” on. If you want to see the video, click HERE –it is so worth the chuckle! Today M decided to make a prototype of something she had been talking about for months. 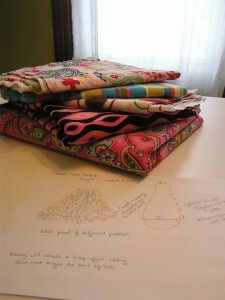 I chose to use some crazy awesome fabric and turn it into my circus for the day (2 birds + 1 stone = genius!). I made the pattern out of tissue paper, cut the pieces and then sewed like a fiend. 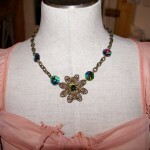 It helped that the lovely Kara Markley was in the workshop and was excited about modeling the finished item. Future options will have trimming and elastic waistbands! 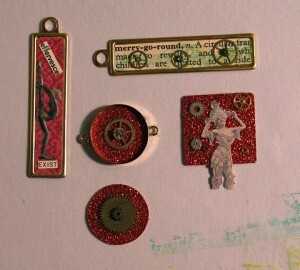 M and K both worked on making some miniature collages so that when we’re ready to cast resin we have some items ready to set. M is very proud of her first miniature collage (shown to the far left of the photo) and has a newfound respect for K’s abilities to cut out tiny people. K is also counting the walking stick and medal she made today as we took photos for our walking stick and medal tutorials, but we didn’t edit those photos yet, and they are not particularly circusy. It was a very long day in the Frenzy Universe today. Both K & M decided they were both really tired and didn’t want to have to be serious, so we cracked out the crayons and pencils and made silly circus drawings. 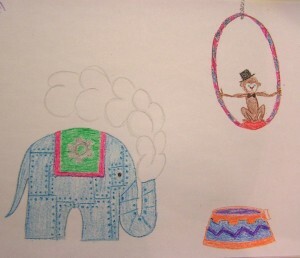 M made a Steam Elephant and Snazzy Monkey using only crayons. 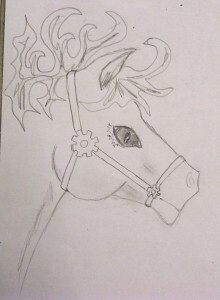 K (who is infinitely more talented in the drawing field than M) drew a Steampunk Carousel Horse after rejecting about five other drawings she felt were either not Steampunk or not Circus. M’s Insights for Week 7: Things always take at least twice as long as expected, sometimes even longer. It will be very difficult to stay on task and energetic while we are traveling over the next few weeks. Working in miniature is still hard. 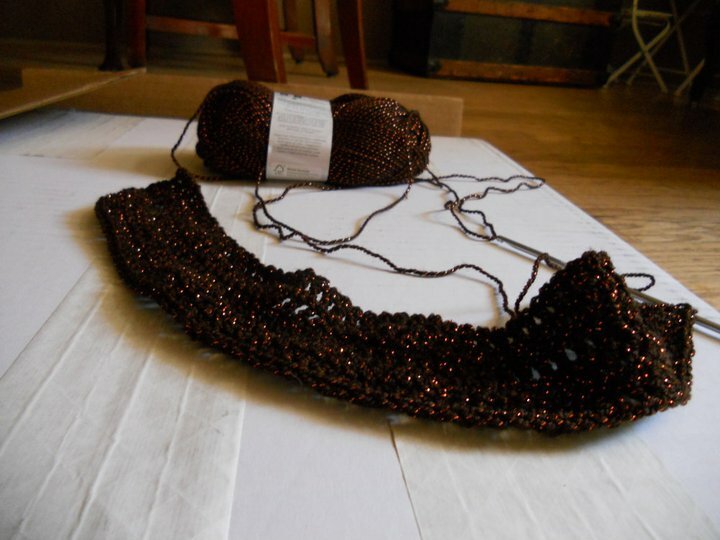 Crocheting is fun, but time-consuming. I should leave drawing and the like to the professionals. 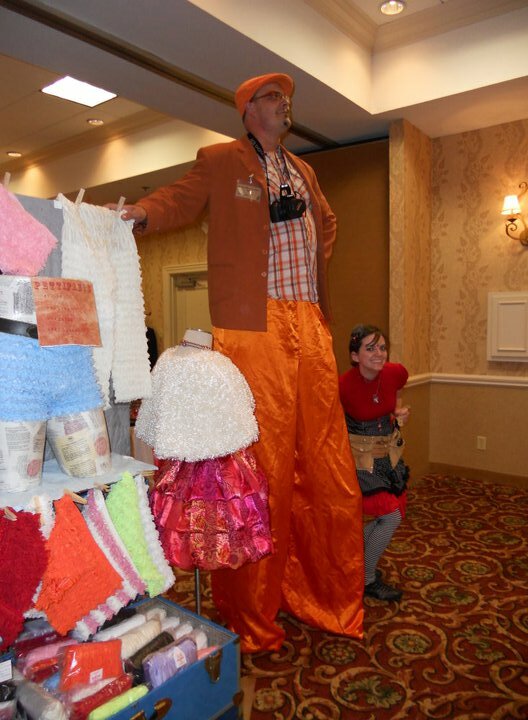 If I can call myself an artist, I definitely must clarify that I am a fiber artist. 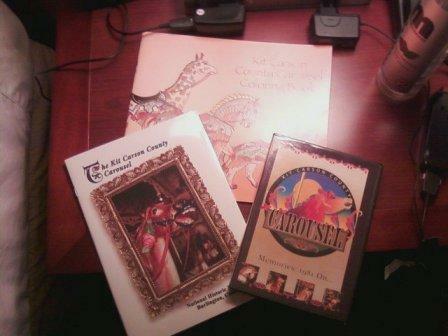 For our Day 36 Circus, K is counting the photos she took at the Voodoo Carnival by the Queen City Cabaret. We had a fabulous time, and we took the best photos we could considering the equipment and the lighting. Please go check out the amazing work of Goblin Road. The show was put on by the Queen City Cabaret, and include Zahara’s Tangled Web, Robin Marks Magic, The Pickled Brothers Sideshow, and Switchblade Syndicate. M’s circus for day 36 is not very Steampunky, and definitely somewhat Dr. Moreau but in a much less morbid and creepifying way. I decided to play with some of my toys! 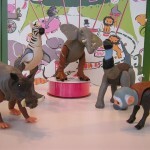 I have a lovely collection of MagnaMorph toys that are animals magnetic body parts that can be switched around with each other. So I made up some new animals. I am still trying to figure out how to classify them taxonomically. 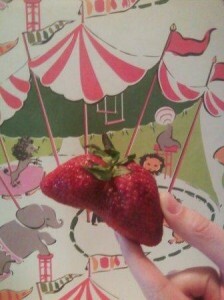 And, yes, the elephant-like creature does have T-Rex legs! Although K made something on Day 37, it took a couple of days to post the photos because I couldn’t get a decent photograph. 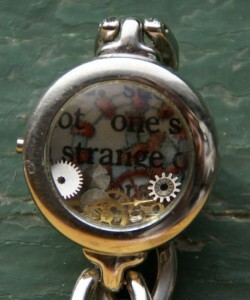 The pendants/charms are made from old watch cases. I collaged printed dictionary pages to the back bezel, and then filled the case partway with Swarovski rhinestones, watch gears, and watch hands. The convexity of the glass in the watch case magnifies the contents, but makes the item very difficult to photograph! It was the mid-morning light right on the windowsill that finally gave me the right light to allow you to see inside the pendants. M spent the day doing fun stuff (a.k.a. taking a day off!) 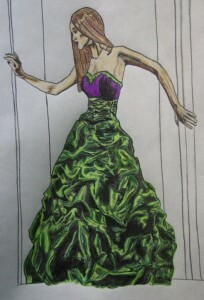 so she humbly submits a simple design sketch of something that has been running around in her head for a while. I am obviously not a classically trained designer, or artist by any stretch of the imagination, but if I can get it down on paper the end result is usually much easier to procure. 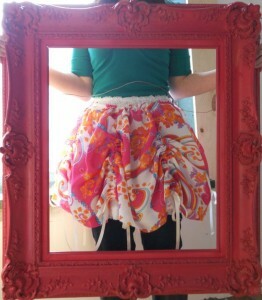 I was inspired by the stash of wild, fun fabric I have been hoarding over the years and a skirt I saw in a magazine that looked like a carousel. 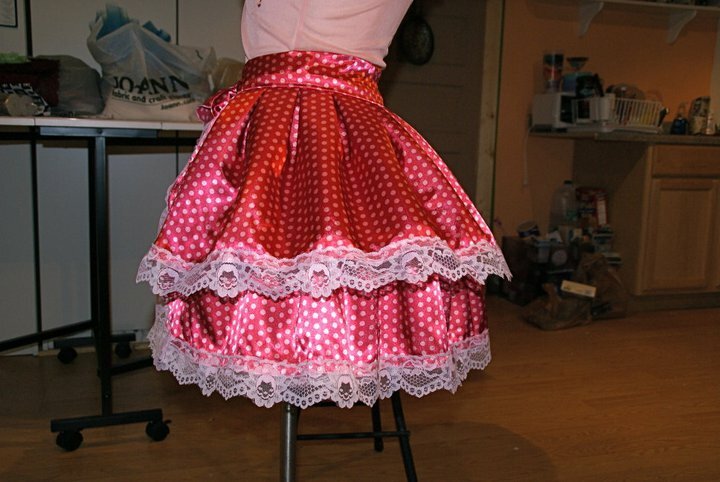 My version is less couture and more cutesy, but I am excited to put it into the “to be prototyped” pile! So, K got confused and thought that Feb. 8 was Mardi Gras. (When in fact, it is March 8). 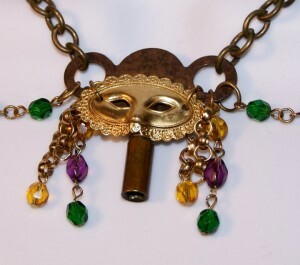 In celebration of Mardi Gras, K stepped a little bit away from the circus theme to make a Mardi Gras necklace by using brass chain and findings, an old clock key, a brass mask, and glass beads in Mardi Gras colors. M didn’t even start making her item until 11pm and was very sleepy so she went simple. I took some stretch red sequin trimming, stitched an old button on one end, then some red silk cording into a loop on the other end”Â¦ and you get a sparkly leg garter! I only stabbed myself with the needle 3 times and fell asleep once during the process. 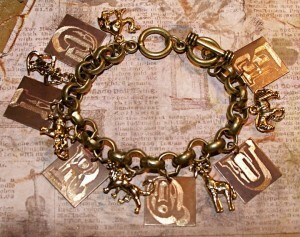 K’s contribution for Day 39 is a charm bracelet made with the brass letter charms I engraved last week and some new animal charms I just received. 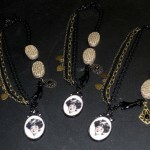 I like the jingly charms; it seems like it would be a fun bracelet to wear. M felt like her Day 38 contribution wasn’t quite “enough” and so decided to add to it. I made the pouch out of a scrap of black lace by folding it over on itself in thirds like you would fold a letter, attached black grosgrain ribbon belt loops to the back and put on a salvaged button for a closure. Then, I slipped the garter through the loops and had a handy place to store a few folded bills, a lipstick, or even a very small, lightweight weapon, should I need it. K & M present “Razzles, the Aeronautic Ape!” Our intrepid stuffed gorilla has taken on the job to be blasted from the cannon at a moment’s notice. 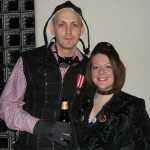 For this dangerous assignment, he required a mini sparkle-vinyl flight helmet and a pair of tiny goggles made from two aluminum tin lids with glass tops. M would like you to know how difficult this vinyl was to work with and to reassure you that future versions of the baby flight helmet will not look so, well, crazy. Today, we both were feeling the LOVE, so we focused on Valentines! 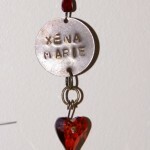 K’s Valentine came in the form of a soldered charm necklace that spells the word LOVE. 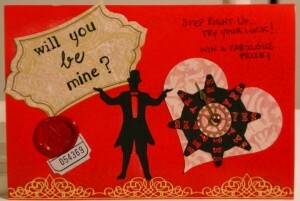 M learned a number of new skills to make this gorgeous, steamy valentine! M likes to call it her “Resistance is Futile” Valentine as whomever is answering the question can only say YES if they play the game right! M would like to add that she made K VERY nervous while rummaging through K’s stash of ephemera and using K’s tools and supplies. It was loads of fun! K would like to point out that without her, M would have set the whole place on fire and other calamities would have ensued. Today, we had a conversation about how many tootsie rolls we could or should eat in a day. 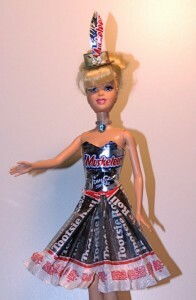 Then, we were inspired by all those Tootsie Roll wrappers we had lying around (LOL). So, M made a dress, while K worked on the little hat. K helped a little with the dress by making the candy wrapper “fabric” with packing tape and by being an extra pair of hands when M needed it. But mostly, M just did an awesome job with a very difficult medium. Anybody have any tips or tricks we should know about for working with candy wrappers? 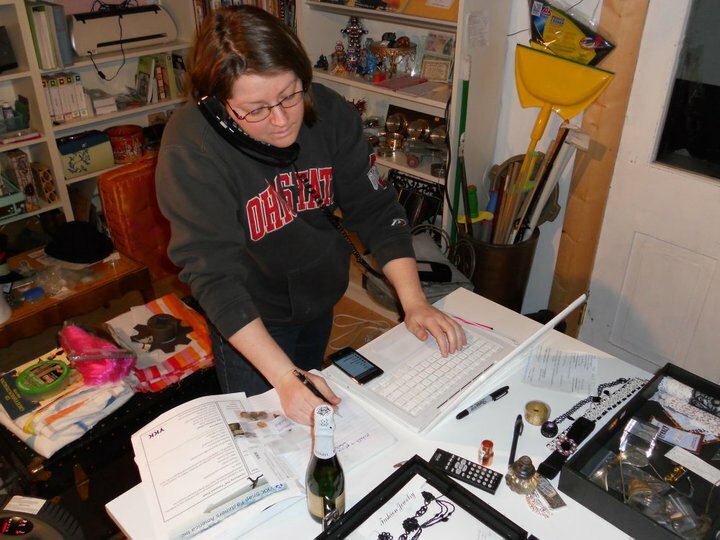 K’s Insights for Week 6: This is something I’ve known for a while, but it was reiterated to me this week: working in miniature is HARD! 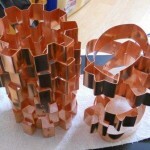 It’s far more difficult to work with tiny pieces to make a small work of art than it is to work on a standard scale. Partly because my fingers are too clumsy, partly because I’m getting old and my eyesight isn’t so good. Also, I’m getting more and more nervous about how we’re going to pull of making art every day while we’re on the road. We spend so much time and use so many materials in each work of art that to keep our commitment during 21 days on the road (amidst conventions, no less) seems nigh impossible. M’s Insights for Week 6: I need to learn to cut myself some slack and have fun with this project, otherwise I will get burnt out and end up hating the creative process. I worked on simple things this week (or at least things that appear simple when completed) and believe I may have found a way to mute the perfectionist in me and the nagging voice that says what I do isn’t good enough. Stupid little self doubts! Oh, and I concur with K’s statements about working in miniature… and would like to add that waxy candy papers are very difficult to control! 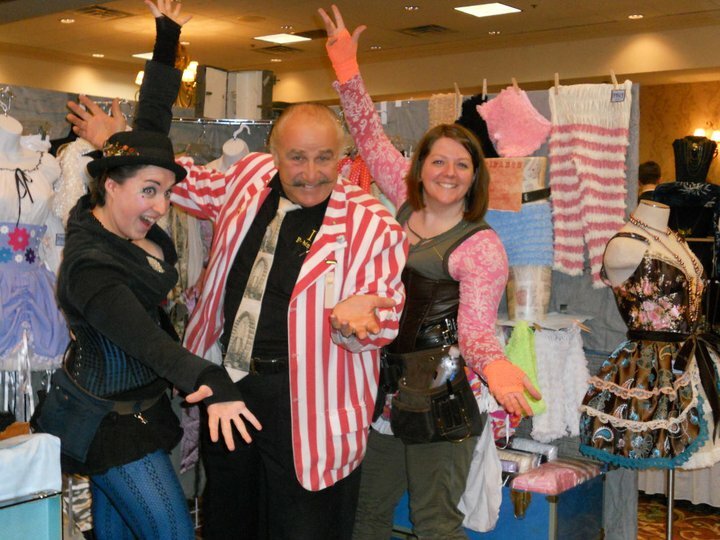 We were fortunate to spend the day at OhayoCon in Columbus, OH, today, where we encountered many talented individuals with fantastic costumes, steampunk and otherwise. 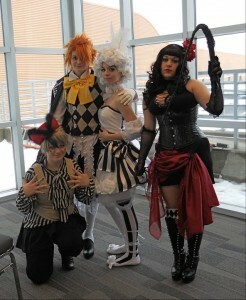 This little group of cosplayers had fantastic circus appeal. If this is you, please claim responsibility for your awesomenosity, and feel free to download the photo from here or the photo gallery on our website! 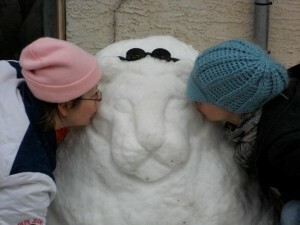 Sadly, our snow lion from last week was more than the folks around here could handle. We awoke this morning to find his face smashed. So, K decided not to let them win so easily and resculpted the lion into the head of an elephant. I’m not as familiar with elephantine anatomy, so he’s a bit more abstract than the lion, but I like him! Unfortunately, the elephant didn’t last 24 hours before being vandalized. Sigh. 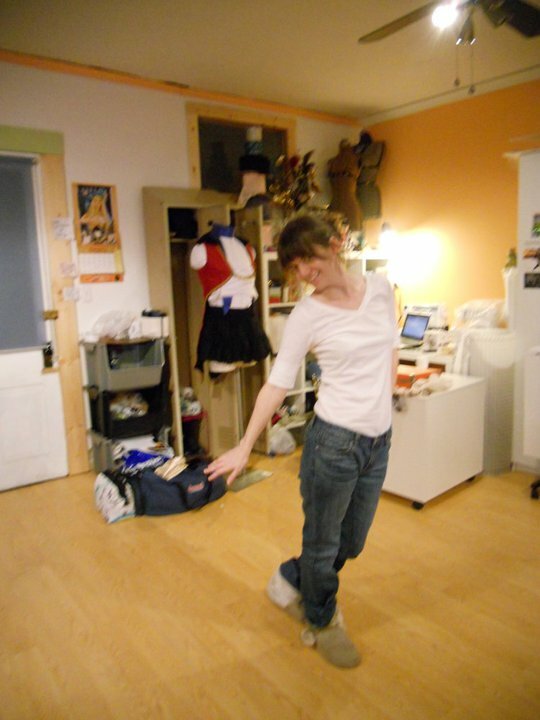 M started the Horseback Stuntwoman outfit in week 4 with the skirt attempt that broke her sewing machine. I got that fixed and moved on to the neck ruffle for day 30. 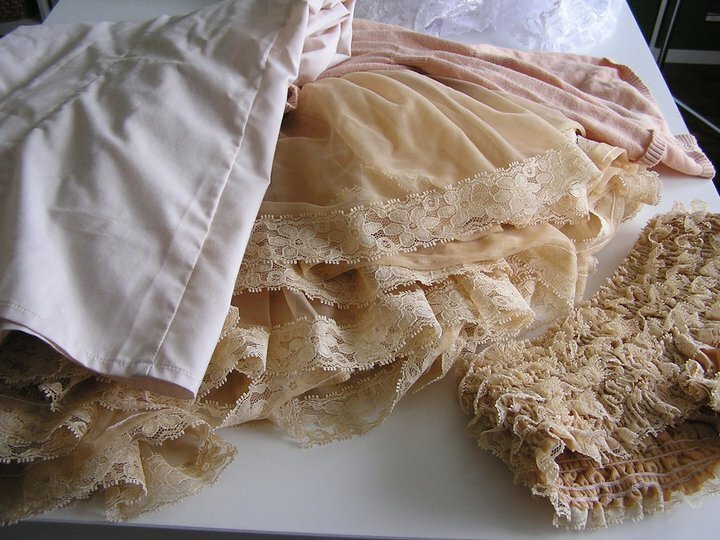 I took leftover pieces of the pale pink taffeta, machine hemmed all the edges and then gathered the length down the center by hand. I sewed a piece of lovely paisley ribbon over the gather to create a collar and then sewed black satin ribbon near the ends to make long ties. 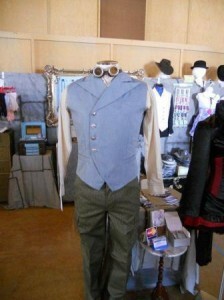 There will be several more similar elements added to this outfit as time goes by. I’ve got a vision, people! K’s art for today was intended for trying new techniques. So, I pulled out some brass discs and stamped them with letters in a circus font. 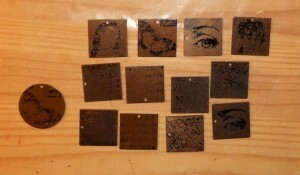 I added some embossing powder to the round ones and heated them with the heat tool. Unfortunately, the embossing powder stuck to the metal outside of the ink, so the lettering came out pretty muddy. With the square discs, I pulled out the engraving pen, and I traced the inked letters. I like the engraved ones much better, but the buzzing of the pen made my wrist numb! 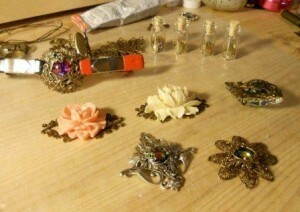 Sometime soon, I’ll add them to another jewelry project. 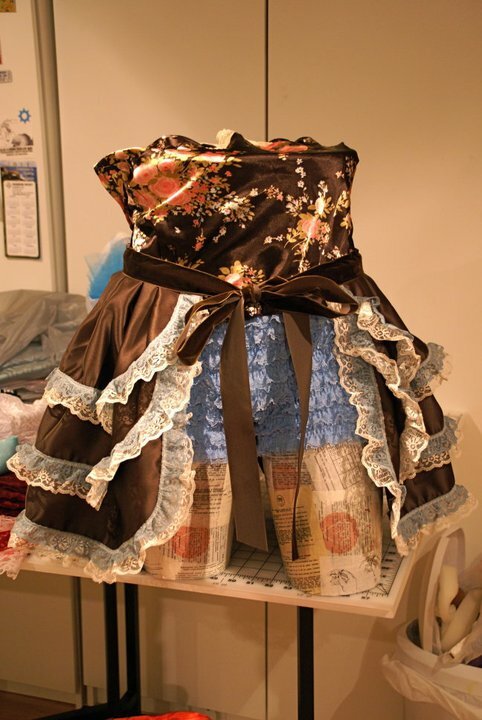 M continued with the Horseback Stuntwoman theme and made rist ruffles to match the neck ruffle from day 30 and the skirt from Week 4. 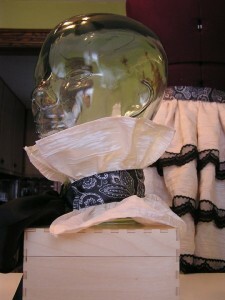 Made from the same taffeta as the skirt and black grosgrain ribbon I used the same principles of gathering used in the neck ruffle and sewed the grosgrain ribbon to cover the gathering stitches and create a cuff. They are rather small as I have tiny wrists, but any future iterations of these pretty little things will be made longer for the less freakish folks out there! The first day of our second month! 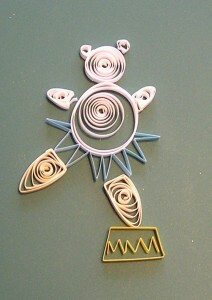 K’s first project of February is two pendants made from old clip-on earrings. 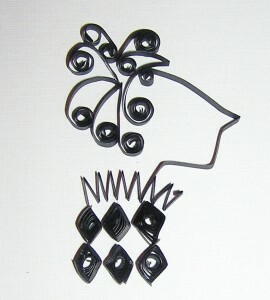 I removed the back of the earring and filed it down, to prepare it for a glue-on bail. 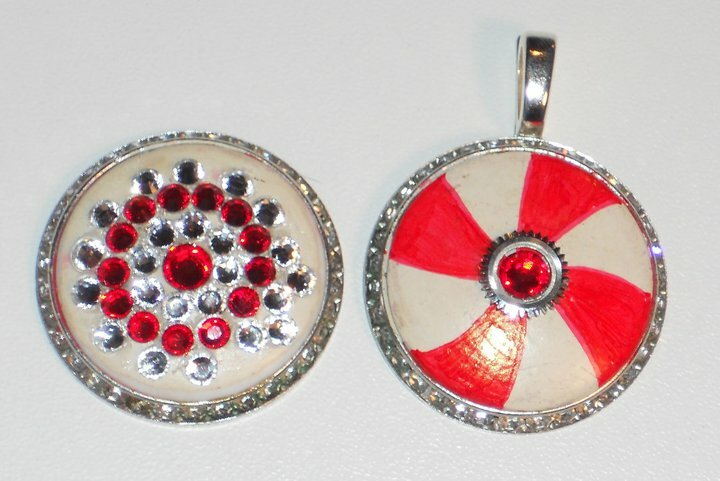 After drawing on the red stripes on the first one, I glued on a silver gear and a red, flat-back crystal. The second pendant involved gluing flat-back crystals onto the other cabochon. But I ran out of crystals and the lights kept flickering (ice storm! ), so I called it a night. 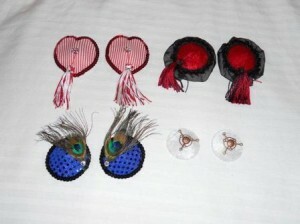 These items will most likely show up in other circus projects later! M decided to use an old sweater she had been saving to make a pair of leg warmers. 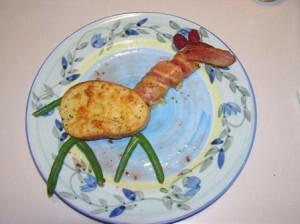 This was a complete experiment that actually turned out better than I expected. I cut the sleeves off the sweater and used the overedge stitch on the sewing machine to keep the cut end from fraying. This caused the knit fabric to pucker a bit creating a nice ruffle so I just ran with it. 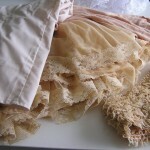 I then took some pieces of elasticized lace and cut them to length to fit around my leg just below my knee. 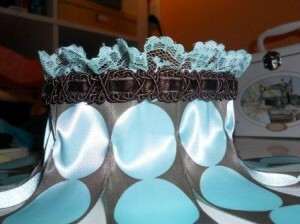 I used two plastic gemstone pins to hold the ends of the garters together. Voila! 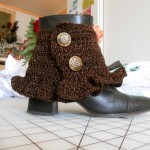 Recycled sweater becomes frilly legwarmers! 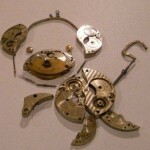 K decided to try a bit of Marianne’s advice, and chose destruction as a path toward creativity today. 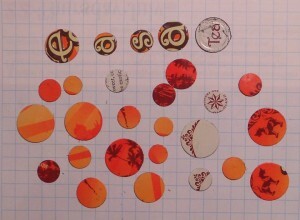 I took an old Thai Tea tin and used the metal disc punch to cut out circular tabs of different sizes for use in jewelry projects. 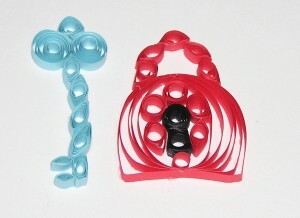 With a smaller punch, I will put tinier holes in each item and use the holes to add jumprings, wire, or other threading material to make charms and connectors. 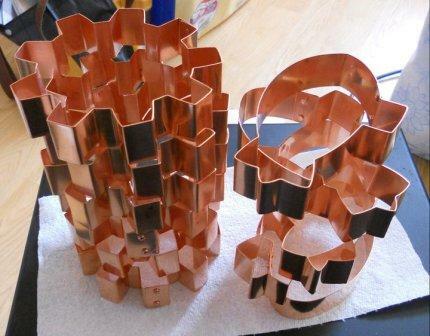 I have plans for a couple of these (some are going into that Fortune Teller necklace I’ve been collecting materials for), but the rest will have to wait for inspiration! M was feeling stressed about having several unfinished projects lying around and the thought of starting a new one was daunting so she decided to actually finish something instead. I have been working on the jacket for K’s Lion Tamer costume in little increments for months now and decided it was time to finish putting on the braid trim. I had to remove the toggle closure, and fanangling the trim gave me hand cramps, but once it was all sewn on and the toggle replaced, I was quite pleased with the result. 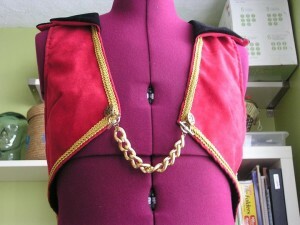 Now just to make the detachable epaulets! Then, I was working on a sketch for a headdress, and since I finished it before I went to bed, I’m counting it as part of today’s circus. I was imagining a headdress for our friend Shaharazade to wear at Burning Man, and used a photo of a bellydancer (and photos of S) as inspiration for this art. I’m thinking feathers, silk flowers and leaves, strings of pearls and beads, and felted dreadlocks would be exquisite with S’s hair and skin-tone. The sketch is not done, and the photo is bad, but I hope we get to make the real thing! M’s circus for the day is her performance of the HipHop Abs Party Bounce and Night Move. K finally talked me into doing the workout with her and as I am terribly uncoordinated it was quite entertaining”Â¦ a dorky Steampunk with no rhythm attempting to find her inner hiphop dancer. If only we had video of the event! 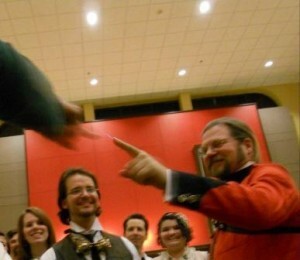 Today’s Frenzy Universe Steampunk Circus is brought to you by BaconPop – bacon-flavored popcorn! K & M worked together today to do some glass etching. We started out with some lenses for a pair of basic welding goggles. Then, we moved on to the glass tumblers we bought for this very purpose. 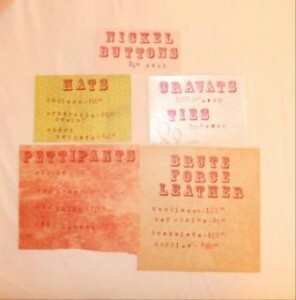 The resists were made from sticky-back vinyl we cut by using the Cricut machine. 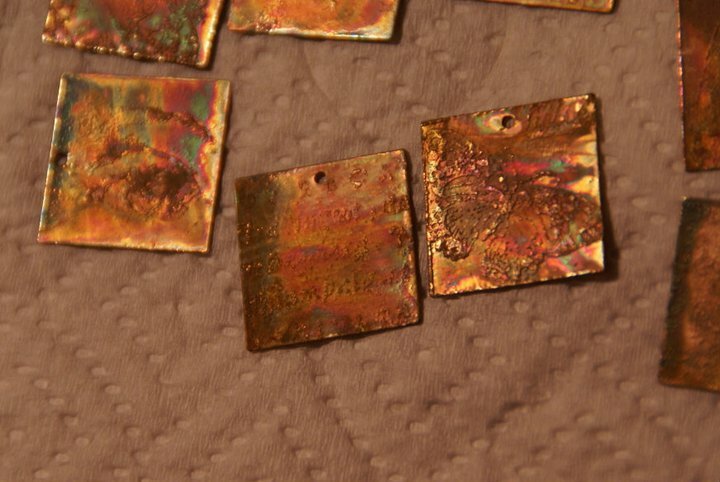 We applied the resists to the glass and burnished them, then applied the etching solution. After washing the etching solution off the glass, we removed the resists, and Voila! 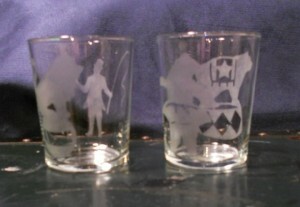 Sorry the photos aren’t very good, but photographing clear, colorless items in bad lighting is not a very good trick. So, K’s first idea couldn’t get finished in time for the deadline, so I decided to put some whimsy in my circuspunk. I asked myself, “How do they get all that fun and magic on the midway?” With a little help from the Magic Midway Merriment powder! And I learned about working with glitter (lesson: don’t). M had a similar problem with her original idea taking too long so she looked around her living room and used some of her favorite things to create a little vignette for the day. My cuddly sock monkey (a gift from my Bestie), a member of the String Doll Gang (a gift from my mommy), and the mini music box I bought in Paris (it plays La Vie En Rose) were the winning combination. Voila! 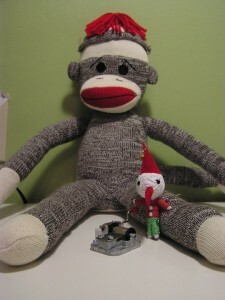 A Mini Organ Grinder and his dancing monkey! Today did not start out auspiciously, with K vomiting for the first half of the day. So, I decided to stay “simple” with my art today. Yeah, right. It’s been a while (years) since I drew anything more than stick figures or tectonic art (don’t ask), so it turned out to be a bigger challenge than I expected. 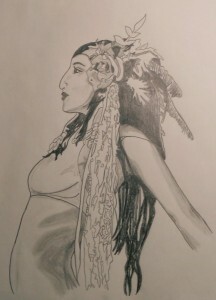 I am reasonably happy with my girl, but I have even more respect for all you real pencil artists out there. 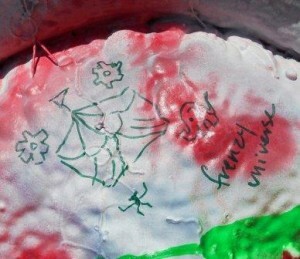 I will probably profane your art again this year, but I will hold you in high regard while I do it! M tried to finish her original idea from day 22 for day 23, but it wasn’t in the stars apparently. Â I had to fight the sewing machine all the way and finally the machine won when the needle broke and then refused to be removed and replaced. 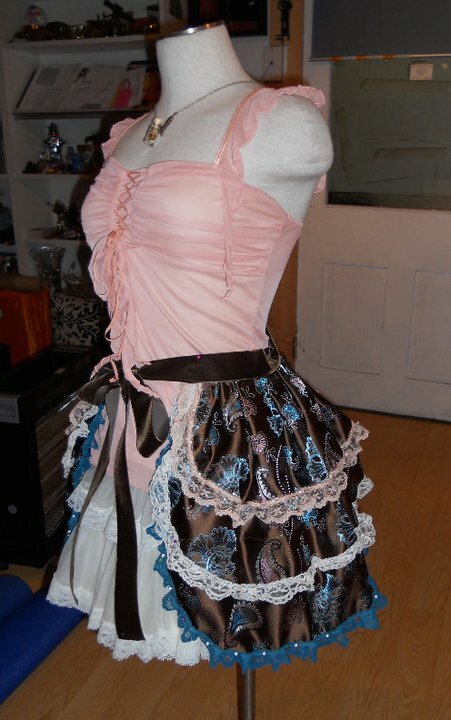 The Steampunk Horseback Stuntwoman’s Bustle Skirt will just have to wait until I can muscle that pesky needle out of its home and replace it with a new one. Sometimes you just don’t get to make the rules. K’s contribution for the day: a bright and cheerful hat band for your circus tophat. 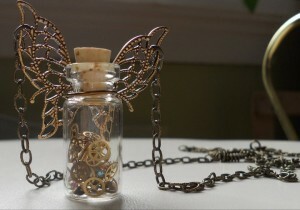 Made from ribbon, an ostrich feather, a large pocketwatch face, and some brass findings. 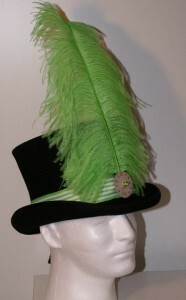 The ribbon crimps, chain, and brass wire hook allow the had band to be adjusted for different sizes of hat. M’s contribution for today: a Steam-Powered Elephant! (Thanks to a few friends for the idea, help getting the supplies, and dinner!) 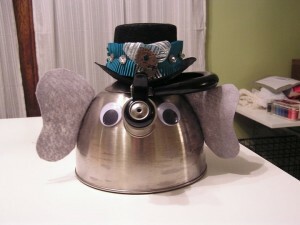 Made from my very own whistling tea kettle, grey felt cut into ears, googly eyes, a mini top hat and double stick tape. (Disclaimer: this is a temporary art piece, all plastic and flammable items were removed after the photos were taken and prior to me brewing my next pot of tea!). Yes, that is the cuff bracelet from Week 3 masquerading as a hat band. K had the worst art day EVER today. I’ve discovered that I’m creatively crippled without my round-nose pliers. Also, I didn’t have the right tools to do the resin casting I planned for today. 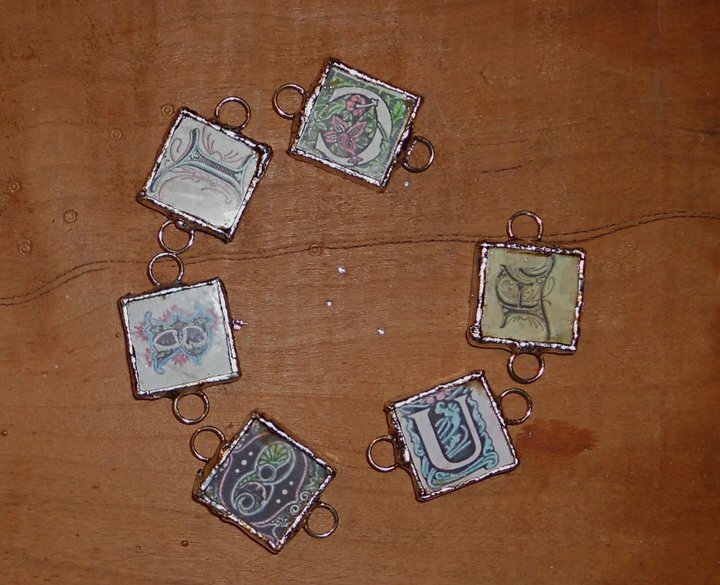 Then, my UTEE and crackle-paint bottle cap charm was a total DISASTER, with the paper floating and scorching, the crackle paint mixing with the UTEE, and the whole thing coming out a mess. 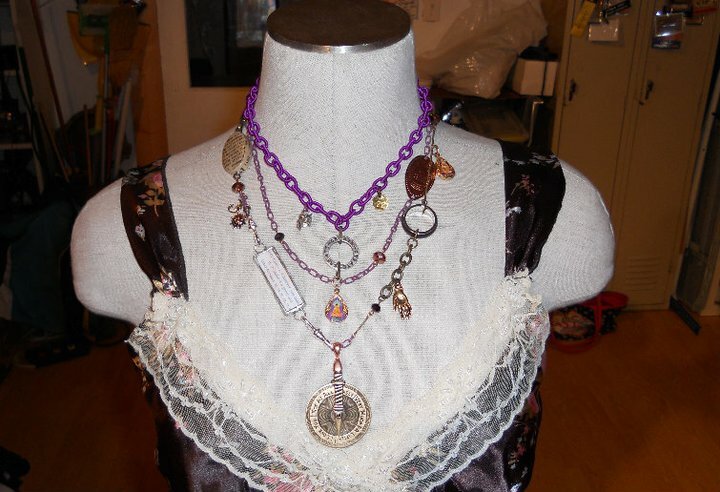 So, I kept working on the fortune-teller necklace I have planned. 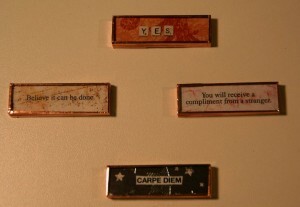 I’m ready to solder the charms made from old fortune cookie fortunes I’ve been hoarding. That’s as far as I got today. 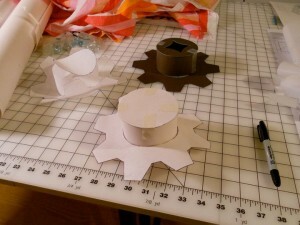 K called it early tonight with a template and two buckram frames for mini-tophats with a gear-shaped brim. The template is made from paper, and the frames are made from two different weights/stiffnesses of buckram. The next phase involves cutting and sewing fabric covers for the hats and final assembly, for which K needed M’s expertise and generous forbearance! M and K had to join forces to complete this little wonder. It’s made from the stiffest buckram we had in our arsenal, and awesome (but totally irritating), flocked polyurethane fabric, and it took hours of hand stitching to complete it! 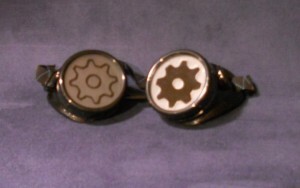 The brim is shaped like an 8-toothed gear or sprocket. The removable hat band consists of tulle, velvet ribbon, and leopard-print polysatin, with replica gears attached with Swarovski pearls. The focal piece of the hat band is antique brass drawer hardware and an old Czech glass button we found at an antique market and three of our peacock feathers. We LOVE it! It exceeded our expectations, and K thinks it makes up for her crummy art day earlier in the week! M is quite pleased with her hand-sewing skills and believes that whatever price people put on handmade hats is probably too low! 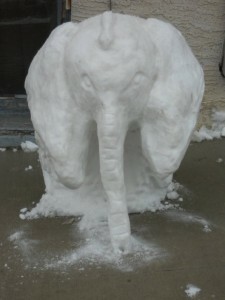 So, we moved from our first-ever hat to our second-ever giant snow sculpture. (Last year, when we got more than a foot of snow dumped on us, we made a giant Buddha). Our life-sized snow lion briefly resided just outside of Main Vine Studio on East Vine Street in Mt. Vernon, OH. Our sculpting weapons of choice: a butter knife and two spoons! 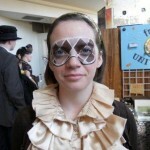 To enhance his steampunkiness, we added some 1920 Antique Glacier Goggles (it just seemed appropriate). 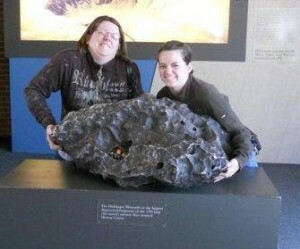 M and K shown for scale. Unfortunately, there are actual jerky punks in the world and our little lion didn’t last but a few days. 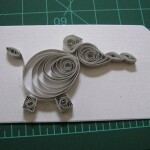 K’s Insights from Week 4: I rely on a lot of different tools and materials for most of my artwork. Making art on the road is going to be a big challenge! I’ve realized that I have a lot more skills that I normally give myself credit for. And I’ve also realized that I have a lot more skills to learn to reach the level of artist I want to be! M’s Insights from Week 5: Sometimes it is okay to ask others for help and for ideas, but I should know I will be expected to execute the actual doing mostly by myself, unless K is around! It is important to have back-up equipment. 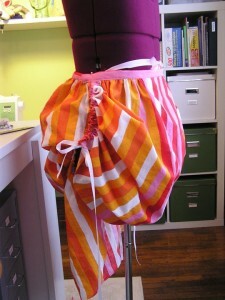 I can’t believe I let that sewing machine kick my @$$! 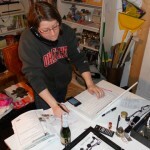 When K and I work together – Holy Awesome! – very cool stuff is created! So glad she is my partner in crime!